RICHMOND, Va. — Thanksgiving guests of Gov. Ralph Northam were treated to more than just turkey and stuffing earlier today due to a surprise visitor at the Executive Mansion. Former governor Terry McAuliffe was seen stumbling up the front steps with a 24-pack of Natural Light slung over his shoulder. “Ehhhh. Maybe?” McAuliffe said before proceeding to pass out Nattys to everyone in attendance. “The bodega down on 3rd Street only had Natty, OK?” McAuliffe yelled while producing a half-eaten stick of beef jerky from his back pocket. 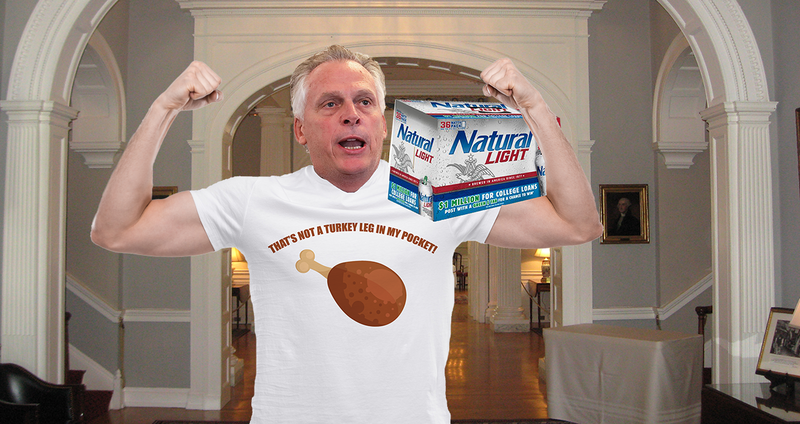 Despite McAuliffe bringing the shittiest beer imaginable, the Thanksgiving dinner was reportedly a success, as everyone in attendance was seen singing “Santa Claus Is Coming to Town” at 2 a.m. on the Capitol Lawn.